At Amazon Tokyo Fashion Week, more than 50 designers presented their creations at the Autumn/Winter 2017-18 collections. Colorful embroidery, creative batik designs and fearless facial jewelry brightened the catwalks where Asian designers presented their collections. Traditional Indonesian batik material – which applies wax-resistant dyeing to the cloth was the highlight of designer Michelle Tjokrosaputro’s collection, where it featured in vibrant jacket and skirt combinations as well as dresses. 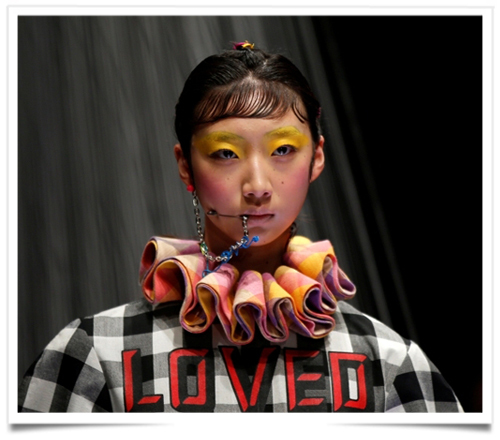 Thai designer Linda Charoenlab added edgy motifs to colorful tartan outfits and complemented the looks with facial jewelry that dangled from models’ ears to their mouths.